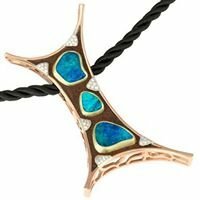 Leon has been a manufacturing jeweller for more than 30 years he started as an apprentice at Hardy Brothers in Melbourne, where he spent 10 years. Then he moved to Tasmania for several years and later settled in Townsville spending 14 years there as a manufacturing jeweller. Leon and his family made a life change in 2008, moving to the small outback town of Winton in Queensland. Smitten with the local gemstone Leon soon acquired his own Boulder Opal mine, where he loves to take refuge, relax and be inspired.